You’ve got a good plan for the customer using really good data analytics. Or, your new digital strategy has been crafted and is ready to be implemented. Your organization agrees with the plan – the executive have approved it. Yet somehow, the operational stakeholders (the silos) are somewhere between appreciative and actively resisting. It happens in the best businesses, e.g., Shopify. The key is that they are finding it hard to get started and take action in a uniform way that will deliver the desired business results. How do you cross the canyon? The executive team may or may not have clarified your role and authority – this might be new territory for them too. So, now as the champion or evangelist of the new strategy you are going to get the key stakeholders on board. Slow down to speed things up. 1. 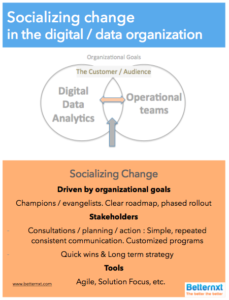 Drive change using a clear organization/business goal and develop your socializing plan. Build your roadmap in language the stakeholders will understand. Think of it as a communication plan as much as a technical manual. View it as a phased rollout. They’re not simply going to jump across the canyon on the defined deadline. Gather requirements. Do your analysis. Launch and socialize. 2. Engage with your stakeholders as if on a journey leading to and across the canyon. Develop a non-prescriptive consultation plan. Listening to their perspective and getting to know their language is as important as your plan. Remember, some folks will be slower to adapt than others – take them seriously, not literally. Roll out the consultations and include planning activities that lead to action. Both the stakeholders and you will be learning by doing – together. Simple, consistent and repeated communication will help the varied levels of complexity by team start to make sense their way. Customize the plans. Each stakeholder has to deliver on the goals, but allow for opportunities to modify delivery. 3. Deploy change management tools to enhance the socialization of the change. Asking stakeholders what they want can be a frustrating exercise, especially among the attention-seeking traditionalists. You don’t have take everyone’s perspective seriously and literally. Just show you are listening. People are trying to collaborate all the time, just not each other’s way. Solution Focus is an approach and toolbox that enables teams to build solutions that work for them (and deliver business goals) by counter-intuitively noticing less about the barriers/problems and more about the solutions and actions they can create to get there. identify useful change and amplify it. Agile Management, or agile process management, refers to an iterative, incremental method of managing the design and build activities of engineering, information technology and other business areas that aim to provide new product or service development in a highly flexible and interactive manner. Don’t forget that customers are stakeholders too!